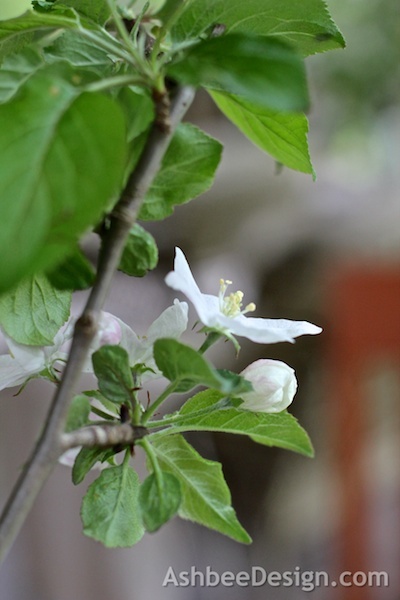 I went for a walk in the woods with David and we happened upon an old gnarled apple tree on the edge of the swamp in full bloom. 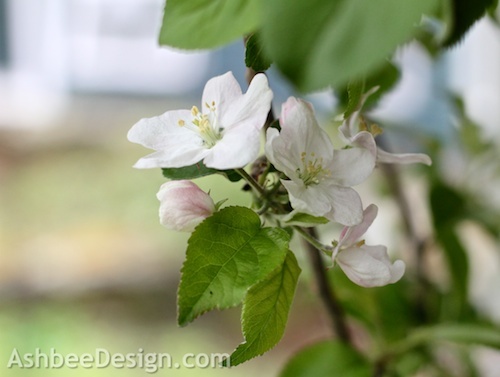 I love apple blossoms so we hiked back to house, got some pruners and returned for a couple of branches. 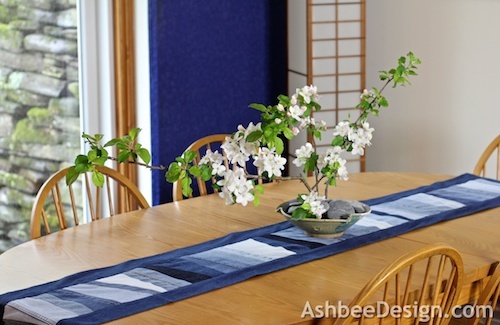 The apple blossoms were a perfect addition to my new denim table runner that I just completed out of recycled jeans. 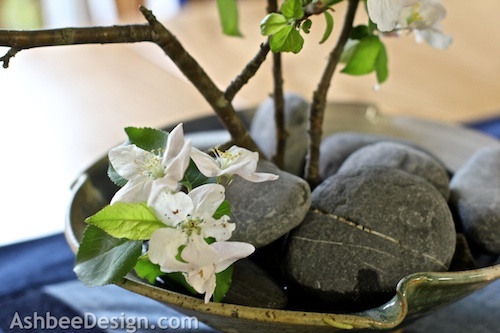 I have a collection of rocks prepared just for this type of off-balanced arrangement. I took a metal flower frog and epoxied it to a flat rock. Each of the branches was then forced down over the metal tines. It was still extremely top heavy so I added additional flat rocks on top. 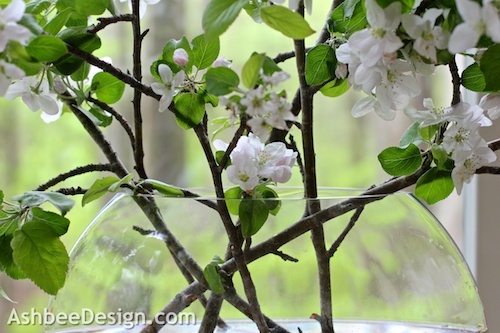 It allows for some creativity in arranging branches. 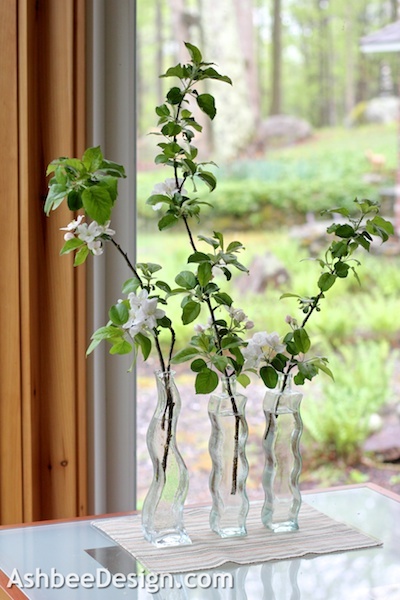 I had leftover sprays of blossoms so I made a few arrangements for our sun room as well. I love how they look in the house. 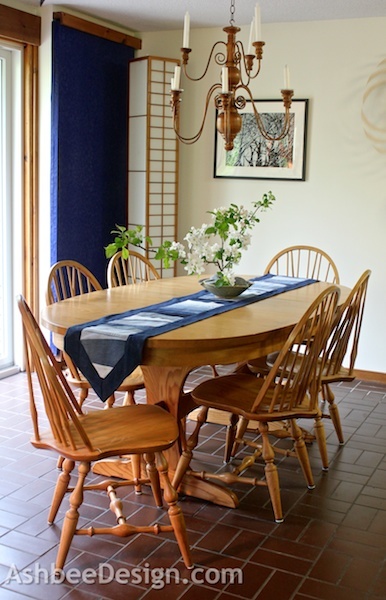 No doubt about it - they add to my style which seems to be an eclectic mix of scandinavian, oriental, and rustic country! Is there one word for that style? How about International Country Flair or Global Country? Eclectic Country? Suggestions anyone? Sharing this post at some of these link parties. They are worth checking out for other ideas. This is really an awesome idea. I love all the different shades in the runner. Over her from VMG206. Hope you have a great day! That is the beauty of denim, so many shades. I just keep collecting old jeans. 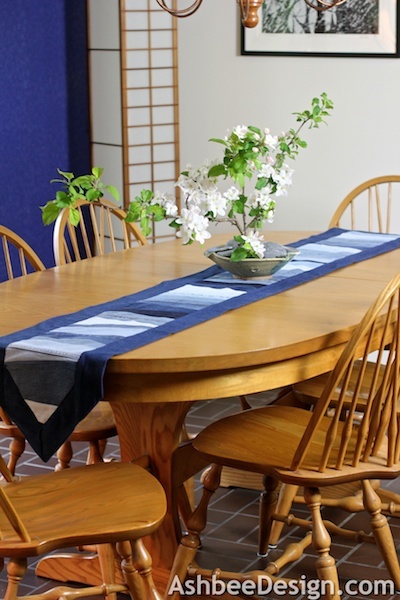 And because of wear and tear the fronts are often a different shade than the backs which adds more shades. Duplicates on Pinterest • What's Up?